In Dutch the noun ‘voorraad’ is used for supply/stock that is available for sale, supplies you may have at home, or general supply/quantity available for use. – Hamsteren: to hoard up [verb] [hamsterde, gehamsterd]. Derived from the behaviour of hamsters. Dutch supermarket Albert Heijn organizes annual ‘hamsterweken‘ during which you can buy two for the price of one (for selected products). – Voorradig: in stock/store [adjective]. – Bevoorraden: to provision, to supply , to stock up [verb] [bevoorraadde, bevoorraad]. 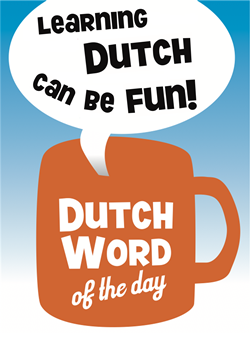 This entry was posted in Dutch word of the day, DWOTD 1.0, Vocabulary Intermediate and tagged bevoorraden, op voorraad, voorraad, voorradig by Sander. Bookmark the permalink. Ja, een van de reden (niet de enige, eigenlijk) ik probeer naar Albert Heijn nooi te gaan!